Joakim Noah is among those who expect the physical nature of Chicago’s Eastern Conference Semifinals series against the Miami Heat to continue when the teams meet for Game 4 at the United Center on Monday night. But he takes it a step further, saying it’s essential for the Bulls, who trail 2-1, to succeed. “It’s our only chance,” Noah said following practice on Sunday at the Berto Center. Bulls forward Jimmy Butler, who has taken the lead on slowing down the NBA MVP this series while playing the full 48 minutes in two of the first three contests, agreed that the physical tone of the series isn’t about to head in a different direction. It’s a style that the Bulls not only need to embrace, but it’s one in which they say they’re comfortable adopting as their own. Meanwhile, Thibodeau reported no significant improvement on the injury front, calling Luol Deng and Kirk Hinrich day-to-day. Hinrich appears to be the closer of the two, though he was limited to some shooting and time on the stationary bike on Sunday. Noah said the Bulls miss their leadership a great deal, but as a team, players remain focused on the task at hand. Thibodeau stressed once again he believes the Bulls have more than enough. 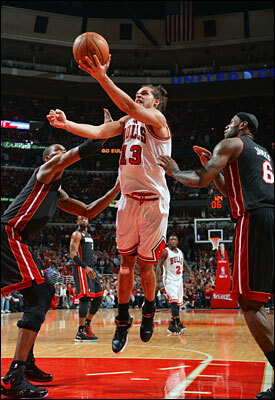 If Chicago is able to slow down Miami offensively in Game 4 that could very well be the case. With an extra day off between games, the Bulls had some additional time to watch tape and work towards making adjustments. Butler identified one specific area he hopes Chicago can correct. “Don’t give up any layups,” Butler said of improving defensively against the Heat. “I feel like when they get into the paint, we’ve got to make them earn it from the free throw line. If we do foul, we’ve got to make sure it’s not an ‘and one.’ I feel like they’ve been getting into the paint entirely too easy.